Pfft...who needs a 33ft trailer... that's fer sissy's. Toss Bommer in my pack, and a rope, go shoot dinner and be back before ya wake up fer toast and coffee.... in yer foofy lil trailer. So what the is that behind you in that there picture??? Aint my trailer, it's someone else's. Was 22* that night. Was nice and cozy in my tent. too. A lil chilly outside it though... brrrr! The last guy that told me how great his tent was got told to get back in it......It was about 38* and rained all day and turned to snow that evening and got down to about 15* that night!!! Yeh, them lil pop-up tent-trailers is starting to look good to me. The ol' bod aint as robust as it once was. Got myself one of them Camper Trailers...the Tent Camper style. Mine is a Coleman Lite Low Supa-Tow. 19' 6" long when erected and I have an annexe for it as well. We have had many happy and enjoyable camping holidays with the kids in it, and its nice and comfortable. The onlt improvements I found necessary to make was to fit a "rope track" to either end, over the extendable beds, and when I put it up I have heavy canvas awnings that provide shade and airflow to keep things a little cooler in our hot summers. However, when I go hunting, both my mate and myself use tents. We both bought ourselves a First-Up tent...takes about 10 minutes to fully erect it and about the same to pack it away. Heaps of room...can put a full size camp stretcher in it and I can also stand upright inside. But if it comes to man-packing in...well, then I use my old Army hootchie, a ground sheet, 3/4 self inflating mattress and sleeping bag. 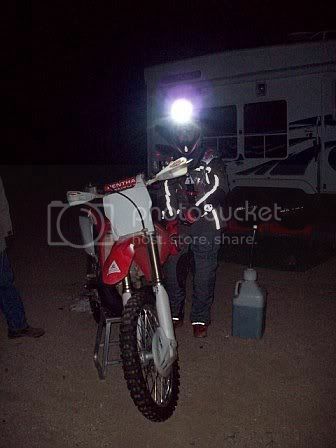 I do however have a couple of dirt bikes, Bultacos, but neither are registered for road use. The new pop-gun is on the way, and, not the orriginal one as posted here.... it even has a shiny bit on it, just for my buddy Mr 111. Pics in about 15 days after it comes, goes through quantine, I bend over and get "the inspection"...etc. et. al. Breeeeaath slowly with a deep breath !!! Kripes...would ya believe it just shipped? Who knows when we'll see it. But it has a shiny bit just fer Weirsy! I think I'm still a firearm behind him in the "onslaught of sales for this year" contest. Soooo, since you got the shiny one just for me does that mean your going to share? [quote"Wiersay"] Soooo, since you got the shiny one just for me does that mean your going to share? So you buy the shells I'll buy the beer, I can shoot waaay more then I can drink.